Cruise Weekly joined several thousand excited revellers aboard Carnival Legend, as she sailed out of Sydney Harbour for the first time on Tuesday 23rd September 2014. It really couldn’t have been a more lovely setting, with sparkling Sydney weather and the ship docked at the Overseas Passenger Terminal perfectly complementing the nearby Sydney Harbour Bridge and the Opera House. Once on board it was into the action, with those on board keen to explore the ship from top to bottom. Although it was still early spring, some braved the somewhat chilly air to experience the ship’s headline attraction, the Green Thunder waterslide. 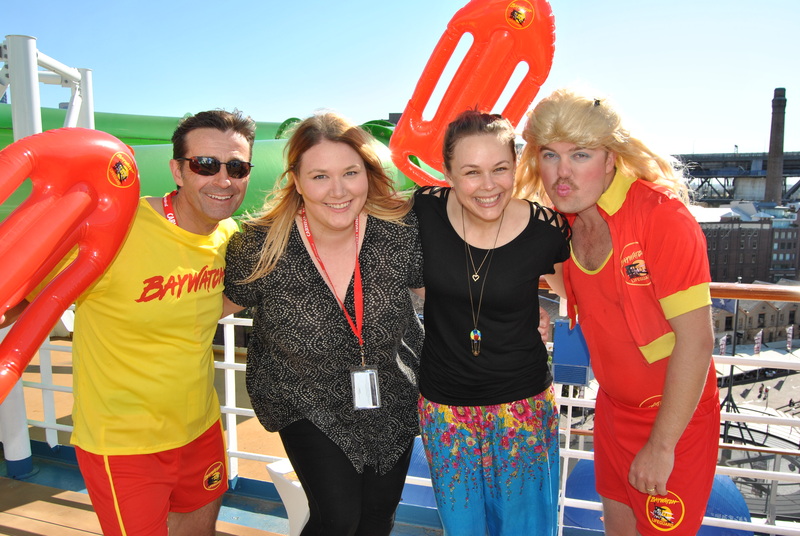 Stations around the ship featured Carnival staff dressed appropriately as “legends” – including this gutsy performance on the waterslide deck. Is that really David Hasselhoff and Pamela Anderson from Baywatch? The Baywatch crew weren’t the only stars on board. CW caught up with The Biggest Loser celebrity trainer Shannan Ponton in the gym, where he was a popular choice for some quick selfies! Others played mini-golf, checked out some of the suites, the on-board spa and shops and of course the wide array of bars and restaurants. Some people even got to meet Elvis as they explored Carnival Legend. However it wasn’t all action, with some choosing to just chill out in the adults-only “Serenity” area at the rear of the ship. Legend has been thoroughly “Aussiefied,” with a crack team of baristas deployed on her arrival earlier this week to train the onboard crew in the art of a perfect coffee. We spotted Carnival Australia ceo Ann Sherry critiquing their efforts. Later in the night Sherry – aka Dame Edna Everage – joined Carnival Cruise Lines ceo Gerry “Crocodile Dundee” Cahill, Carnival Cruise Lines director Australia Jennifer “Kylie Minogue” van de Kreeke and Shannan Ponton to toast the ship’s inaugural season. Then the party really started, with those on board kicking up their heels for a night that was truly LEGENDARY.